You are here: Home / FAQ / How To Do You Cancel A PayPal Subscription? How To Do You Cancel A PayPal Subscription? Question:We’ve had a customer request to cancel a monthly subscription that is set up with PayPal payments through Subscription Boss. I have made the subscription inactive in the Infusionsoft customer record. Will the recurring payments get automatically cancelled at PayPal, or do I need to go to PayPal and manually cancel the recurring payments profile for that customer? This customer’s PayPal profile is set to charge on 5/26/13, so if you can get back to me before that I would really appreciate it. If it will cancel automatically, I wanted to not interfere with that so I could see how it all transpires. Answer: You will need to intervene as nothing will transpire unless you take further action. The way to cancel a subscription is to make the cancellation directly on PayPal. You can find the PayPal Profile ID in the custom tab on the Subscription Order. Then log into PayPal and do a transaction search using the Profile ID. View the last payment and then click the link called View Details. This takes you to a page where you can cancel the subscription. 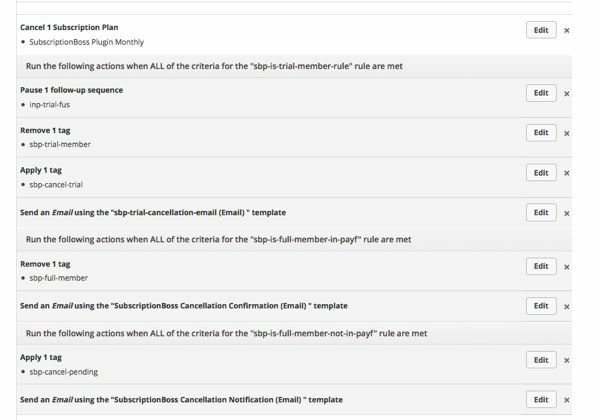 PayPal will send an agreement cancellation notification to SubscriptionBoss which will in turn activate the cancellation action set you have defined for that subscription in the Payment Event Actions section. This action set is identical to the one you would use if the person was paying by credit card wanted to cancel. Below is an example for a subscription that includes trial period and hence the email sent to the member is different if the cancellation occurs during the trial. If also has some rules in place to delay the cancellation until the end of the billing period if the member is up to date with payments, but will cancel immediately if the member is in payment failure. The following cancellation action set is used whether the member is paying via PayPal or credit card. 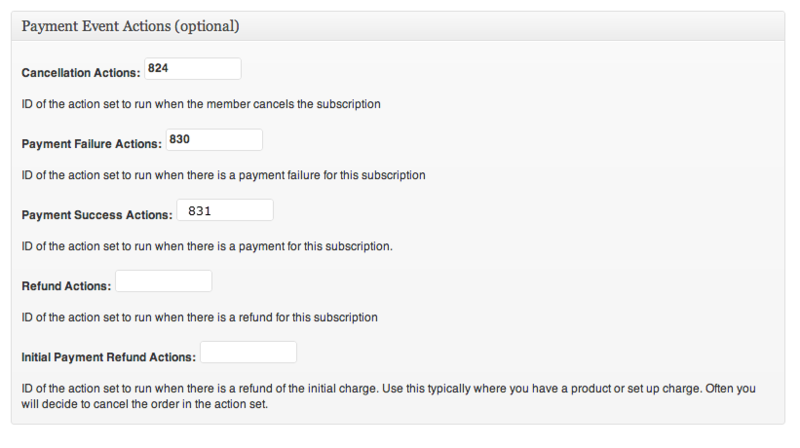 If you cancel the subscription directly on Infusionsoft then SubscriptionBoss does nothing as it is not in the loop. You still need to go into PayPal and cancel the Subscription before the next payment is due.